Question: What are key determinants of response capacity to climate change induced floods, and what can be learnt for European flood control and disaster risk reduction in general? 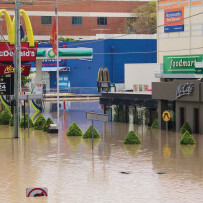 Ecological components: The Brisbane floods was an unexpected extreme flooding event that caused loss of life, damage to public and private property including infrastructure, destruction of habitats, and on-going economic and psychological impacts to resident communities. Institutions: Institutional fragmentation was overcome through unprecedented coordination between agencies to ensure community safety through deployment of resources at the local government scale. Practice and facilitation: Previous silo responses to water governance among a range of actors and agencies were re-focused through a collective learning approach and response to the disaster. High levels of social capital and social cohesion were demonstrated.